I thought Prime Minister Papandreou's analogy comparing humanity to a parasite that is devouring its host and thereby condemning itself to die with it, was particularly apt and disturbing. I also like how he urged the world to make a new deal with the planet. How about a deal to treat it with love and respect? Can these 'leaders' ever come to any intelligent agreement on the controls that must be set in place now??? What have we done? What are we doing? Thank you for posting these quotations and commenting on them. 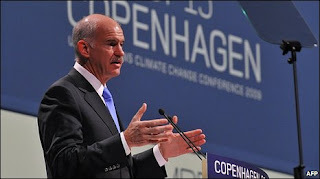 I agree with you that Mr. Papandreou's comments are the most provocative and memorable. I'm not sure we know what we're doing or have the wisdom or the will to respond usefully to our situation. In any event, if we manage to find the appropriate response it won't be the planet we're saving (I'm sure it will do fine without humans mucking it up); it will be ourselves we're saving. In the end it always comes back to the same thing........money. It is profitable to argue against human-caused climate change. There are powerful forces which will do what is necessary to muck up positive change. I fear the parasite will never stop sucking. I'm saddened to agree that it always comes down to the money. What people don't understand is this is REAL. My husband and I lived in Alaska and have physically observed the recession of the glaciers at unbelievable speeds. This is being caused by the pollution from greenhouse gases. The great flood certainly may happen again as well as the ice age and many of the other natural disasters. If mankind is foolish enough to believe that it won't affect them, they are wrong! Every man, woman and child in this world can make a difference. We must all make an effort to use the clean forms of energy (sun, wind, water). Make a statement that forces the politicians to listen. Big business doesn't matter as much as one's family and friends. Thanks so much for posting this. Let's pray it's not already too late.